The Gompa Merigar West is a Tibetan temple (gompa is the definition of the temple that come from the regions of Tibet, Bhutan, India and Nepal) built in the 80’s close to Arcidosso. 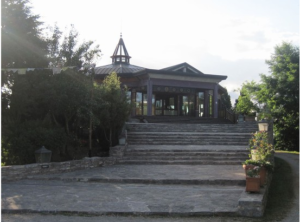 In recent years, in fact, Namkhai Norbu founded a gar – or center for the teaching of Dzogchen philosophy – near Mount Lip, occupying an area of about 50 hectares in the heart of nature, with certain ritual elements, such as the Statue of Buddha and the stupa, or reliquary monument. In 1990, the gar was added the Gompa, or Temple of the great contemplation, a large octagonal building decorated with Tibetan paintings and works of Namkhai Norbu; at his inauguration, in that year, he intervened Tenzin Gyatso, XIV Dala Lama, the highest religious authority of Buddhism and reincarnation of the Lama.